I sent an SMS and verified this works although it’s not clear when the minutes will be credited to accounts. AT&T has run similar promotions in the past exclusively for iPhone customers, but this one looks like it’s open to all AT&T customers in general, regardless of your phone. 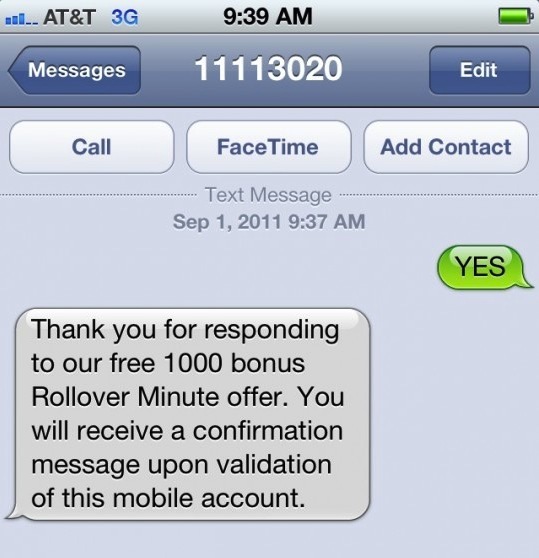 I already have a gazillion rollover minutes but who doesn’t like free stuff? Heads up to iDB for the discovery. Got the confirmation, but I wish it was 1000MB of data instead! I called AT&T on this and was told it was a scam. If anyone out there has actually seen those 1000 minutes appear in their account, I definitely want to hear. And if you’ve received the text message, I’d really recommend calling customer service before you reply. It is not a scam, some iPhone users are getting the offer directly from AT&T. The number, 11113020, is the same as AT&T’s prior free minutes offer. This is no longer working. I am unable to send the SMS.